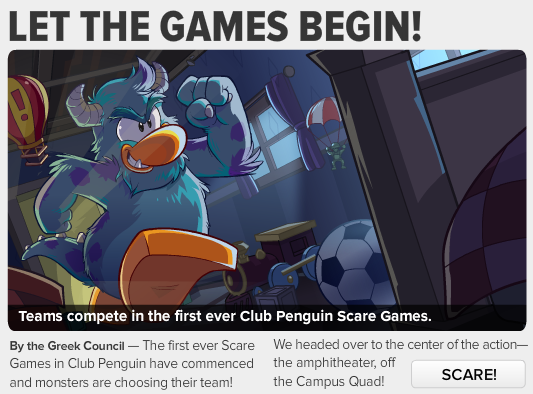 By The Greek Council -- The first ever Scare Games in Club Penguin have commenced and monsters are choosing their team! We headed over to the center of the action-- the amphitheater, off the Campus Quad! Having trouble choosing a fraternity or sorority? Head over to the Fraternity Row, just off the forts. You'll find four fur-raising houses to choose from. Penguin Style - Freshen up your look with these fabulous finds! Featured Postcards - Welcome a new friend! Igloo Furniture - Prepare your igloo for a galactic get together!